With winter in full swing, pet owners are being urged to take precautions to protect their animals from injuries caused by ice and deicers. Be wary of ice. In addition to possibly slipping and falling, ice and icy crust on snow can cause cuts and abrasions to a dog’s paws, or contain embedded objects that could be harmful if stepped on. Deicers have the potential to harm pets. Some, like calcium-based products, may be more toxic, while others, like those containing urea, might be less toxic. Most of these products are relatively safe and may cause nothing more than an upset stomach or mild skin irritation. Too much contact or ingestion could lead to dry, cracked, bleeding, or burned paws, or diarrhea and vomiting. While deicers labeled “pet-friendly” may be safer, there is no requirement for products marketed as such to meet any agreed-upon standard. Alternative products, such as sand or kitty litter can provide additional traction on icy surfaces. Be sure to limit the use of chemical deicers to its recommended application amount, and use a shovel to clear the area of slush and salt after the product melts the ice. Always supervise a dog while outside to prevent them from ingesting salt off the ground. When returning home, use a towel to clean off a dog’s paws, legs, and belly and remove any deicers that may be hitching a ride in their fur or between their toes. Check paws for any signs of irritation, cuts, or swelling. Booties can also reduce the risk of injury or illness on a dog’s paws and wax-based petrolatum or lanolin products can protect paws from ice and cold. For more tips to share with pet owners, visit AVMA’s cold weather guide, here. 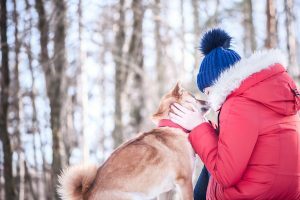 The post AVMA offers cold weather safety advice for pets appeared first on Veterinary Practice News.